The coming dark age: Voter recounts in three close elections in Florida and Arizona, all won initially by Republicans, now suggest there is significant misconduct going on to favor the Democratic candidates in order to change the results. Are the local Democrats in Arizona and Florida trying to steal these elections? Maybe. The evidence sure looks that way, based on past behavior. For one thing, in practically every close election requiring a recount in the past two decades the recount somehow always finds more votes for Democrats, sometimes in very suspicious circumstances. Moreover, practically every voter fraud case investigated in the past few years has also appeared to be fraud in favor of the Democrats. While I am sure I could do some digging and find a case or two that was done to favor the Republicans, that would be the exception that proves the rule. The problem here is not that the Democrats are doing this, but that it has been obvious for the past decade that this party has become very corrupt and power-hungry, and needs a major house-cleaning. Unfortunately, in the election that just passed, the voters across America did not do this. Instead, if anything they gave the Democrats an endorsement, electing them to more seats in the House and not defeating them soundly in the Senate. They also gave them more power at the statewide level, including more governorships. The result? Americans have essentially told the Democrats they can continue their bad behavior, and in fact are free to expand it as much as they want. I expect the results of these elections in Florida and Arizona to become Democratic wins. Nor will this be the end. Americans decided it was all right to forgive political corruption, including the most disgusting smear campaign I have seen since the McCarthy era in the 1950s. Link here. The results, like last week, are inconclusive as to indicating what might happen in November. The only clear pattern is the continuing increase in the American political divide. Pro-Trump candidates seemed to win more Republican primaries, but radical leftist candidates seemed to win more Democratic primaries. The elections that took place yesterday indicated both good and bad things for the future of the United States. First, every socialist candidate who was endorsed and campaigned-for by socialist and Democratic candidate for Congress Alexandria Ocasio-Cortez was defeated. It appears that Americans are not yet convinced that socialism, a nice word for communism and its centrally-controlled society, is the way to go. At the same time, her candidates did get a lot of votes in every one of their primary races. From this we can surmise that Democratic Party voters are increasingly enthusiastic about the idea of a full government take over of all aspects of our society, including the end of private property and capitalism, as advocated by Ocasio-Cortez. In the past such candidates would not have been able to garner more than a handful of votes. That has changed, and in a bad direction. Similarly, it appears that the conservative Republicans supported by Trump were almost all winners. Yet, most won by the skin of their teeth. Worse, supporters of the Democratic Party almost immediately questioned the legitimacy of these wins, with some claiming that it could only have happened because of Russian interference. Expect more of this in the future. It really appears that most Democrats truly believe that all decent people agree with them, and that only racists and bigots or Russian plants vote against Democratic candidates. If they win back power in any election they are going to move to oppress their opponents. They’re coming for you next. In yesterday’s primary elections, scientists running as Democrats generally did poorly. Science-minded candidates seeking seats in the next U.S. Congress took a drubbing from their Democratic opponents in yesterday’s raft of primary elections across the country. Voters went to the polls Tuesday in eight states to choose nominees for the November elections. And none of the candidates who touted their scientific credentials—a list that includes volcanologist Jess Phoenix, technologist Brian Forde, pediatrician Mai Khanh Tran, and geophysicist Grant Kier—won their contested contests. In one California district, neuroscientist Hans Keirstead is trailing in a race that is still too close to call. This article in the journal Science is fun to read in that it blatantly reveals that journal’s partisan Democratic Party leanings: the goal is to beat Republicans, and the hope was that scientists would do it. For the scientists however, it turns out that Democratic Party voters really don’t like science and the skeptical demands it requires. Kind of reminds me of the secular liberal Jews who blindly vote Democratic, even as that party works to betray them. The election results from Tuesday, where Democrats won most of the significant races, has produced a lot of commentary, from both conservatives and liberals, about its significance. To me, however, these results merely confirmed the increasingly regional nature of today’s partisan politics. This story, about a victory by a Democrat state senator candidate that puts the Democrats in complete control of Washington’s legislature, illustrates this best. Dhingra’s victory in Washington state over Republican Jinyoung Englund means the West Coast is now the solid center of the resistance, with Democrats controlling legislatures and governorships from Seattle down to San Diego. The Democratic victories on Tuesday all took place in areas where they strongly dominate (the coasts and urban centers), thus merely solidifying their control over those localized regions. I expect that future elections will show Republicans solidifying their control over their own regions (which is the rest of the country). In other words, people are beginning to choose sides, and we are heading to a regional and political divide that can only be solved in one of two ways: The U.S. splits, or a civil war (in the literal sense) breaks out. Testimony at one public meeting of Trump’s election fraud commission revealed significant evidence of several thousand individuals who have voted twice in elections. The image on the right is one of the powerpoint slides used by Block during his presentation. which can be found here. The public meeting included additional testimony from many other investigators, all of whom showed that if voter fraud is not widespread, the situation is such that it could easily become so. 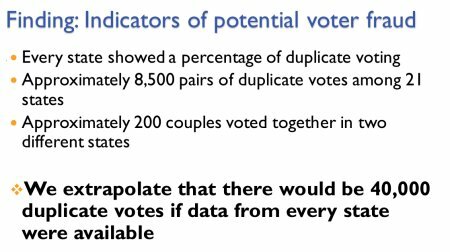 One recommendation that would prevent double voting as shown above would be to allow the states to more easily access each other’s databases in order to compare them. Despite their screaming and protesting since the election of Donald Trump, the Democratic Party’s effort to win elections continues to falter. Read the whole thing. Essentially, the protests and wild mindless opposition to Trump by Democrats nationwide has failed to persuade anyone who voted for Trump or the Republicans to switch their votes. In fact, the failed Democratic election effort, which included significant campaign spending in some very small local elections, suggests that the voters have been turned off by their almost hateful opposition. Not only did vulnerable Republicans win their special elections, they appear to have generally done so comfortably. In a Politico article today about the political state of the Democratic Party, it appears both party leaders and the base are increasingly leaning to a “a take-no-prisoners posture” aimed at a continued and total opposition to all Trump policies. Essentially, it appears that the Democratic Party is coalescing around a strategy similar to that used in Wisconsin against conservative Republican Governor Scott Walker, a strategy based on no compromise and no negotiation and included legislative boycotts, demonstrations, protests and occupations inside the statehouse. In Wisconsin that political strategy was a total and utter failure. Not only did the Democrats fail to stop any of Walker’s policy initiatives, their actions apparently helped shift that state into Trump’s hands in the November Presidential election. I suspect it will result in the same utter failure in the 2018 midterm elections, which do not favor the Democrats anyway. It is especially amusing to note the political experts the Politico quotes for its analysis. Mark Longabaugh was a senior strategist for Sanders, who lost. Jason Kander ran for a Senate seat in Missouri in 2016. He lost. Anne Caprara ran a PAC that strongly campaigned for Hillary Clinton, who lost. She also held important strategy positions in the Democratic Senatorial Campaign Committee from 2010 to 2014, a time period when the Democrats lost control of the Senate. Margie Omero has been a very visible pollster on television who consistently predicted that Hillary Clinton was almost certain to win the election. As we all know, Clinton lost. Bob Shrum is also known as the man who has backed nine presidential Democratic candidates during the past three decades, all of whom lost. His record is so bad that it is known in Washington as the Shrum curse. The streak continued hilariously in the November election, when he announced just after Labor Day that the election was over and that Hillary Clinton was now certain to win. His curse immediately kicked in, as that was the exact moment her polls started to drop. And as with all of Shrum’s other political picks, she lost in the election. As I noted last week, Einstein’s definition of insanity was doing the same thing over and over again and expecting a different result. This is more evidence that the Democrats are following this mental path. The Democratic Party is attempting to analyze the recent election to try to find out what has been causing their significant losses in order to prevent further election defeats and bring about a recovery. Not surprisingly, they are blaming everything and everybody but their own policies. Party insiders are reluctant to blame the popular Obama but cite plenty of reasons for the decline. These include a muddled economic message; an overemphasis on emerging demographic groups such as minorities and millennial at the expense of white voters; a perception the party is elitist and aligned with Wall Street; a reluctance to embrace the progressive populism of Senator Bernie Sanders, the former presidential hopeful; and failure to field strong candidates in key states. The highlighted text above shows how completely divorced from reality this Democratic Party continues to be. Most of the country rejects socialism, and it was the Democratic Party’s increasing tilt towards socialism that is hurting it badly and caused it lose control of almost all the state legislatures nationwide.. Do they recognize this? Absolutely not. Instead they want to become more socialist. Moreover, most of the other reasons they cite for their losses either blame outside forces (such as Republican efforts to require an ID to vote) or poor messaging. It is never anything they did, such as impose Obamacare and run the government badly. Moreover, that the Democrats continue to increase their dominance in the big urban areas should not be used by them as a sign that their policies are right. The big urban areas are also generally places with the worst quality of life, the most crime, the worst poverty, and biggest government deficits. Even if the citizens in those places can’t see how badly they are being ruled by Democrats, the rest of the country does. Moreover, it will be impossible for the Democratic Party to recover significantly as long as it relies solely on the voters in these concentrated urban areas. To get the rest of the country to consider them worth voting for again they are going to have to face their own policy failures and change direction. Sadly, I see no evidence that they are going to do this. Though the article at the link focuses on how in this year’s election the Democratic Party has lost its traditional support from white blue collar Democrats, I think it illustrates quite forcefully the increasing political polarization between the cities and the rural parts of the country. “There are 490 counties in Appalachia technically, which is defined by federal law. Hillary Clinton won 21 counties in that region,” he said. And that is it. She did not win a single county in Appalachia that is mostly white, non-college-educated and has a population of under 100,000 people. Looking at the map, the 21 counties she won were either college campuses like Virginia Tech, Cornell, Penn State and Mississippi State or counties in major metropolitan areas like Atlanta, Birmingham, Ala., Winston-Salem, N.C., Youngstown, Ohio, and Pittsburgh. And she also won five counties in Mississippi that are nearly majority black. “I went back and looked at the home precinct in Tennessee where I grew up and Bill Clinton wins it, Al Gore gets forty percent, Obama gets 28 percent and she got 18 percent. In short, Donald Trump got 80 percent of that vote,” he said, astounded at the cultural shift among Appalachians. What does all of this data tell you about America? Todd says it is simple, “There are absolutely no more blue-collar whites in the Democratic Party. They just don’t exist, even the ones who want there to be have recognized there is no room for them,” he said. These voters had stayed with the Democrats forever and now 80 percent of them in Appalachia have voted Republican. “That means they don’t know anyone who voted for her,” he said. This polarization also explains why it is becoming more common for the choice of the electoral college to not match the popular vote. Democratic voters are increasingly packed into big cities that cover very small amounts of area. The electoral college as well as Congress were specifically designed to prevent such concentrations from dominating elections. These results also show that the Democrats are not doing a very good job convincing anyone to vote for them outside of their reliable core constituencies. In fact, if anything the policies of the Democratic Party has been repelling everyone away from it, except in those big cities where a large percentage of the voters are their direct welfare clients, dependent on government aid. Cleveland Indians fans have rioted across the country in protest of the 2016 World Series. Despite knowing the rules of the game prior to playing, they were unhappy they lost and demanded the outcome to be changed. They could be heard chanting #NotOurWorldSeriesChampion all across America. Even though the Cubs won 4 games and the Indians only won 3, since both teams scored 27 total runs throughout all 7 games, they are being declared co-world champions. It appears that Donald Trump has won what I have been calling the November Democratic primary, and will take the office of President of the United States this coming January. Will this make much difference? I am very guardedly optimistic. Trump remains at heart a moderate Democrat with mixed leanings. His experience during this campaign however has also clearly pushed him rightward, as he suddenly found himself the target of liberal hate. Moreover, the people he has been listing as possible cabinet and administration appointees during his term in office suggest a slightly right-of-center rule. At the same time, the entrenched and corrupt culture that rules Washington and intellectual society will not accept a Trump administration meekly. They will fight any effort by him or his supporters to change that culture, or to wrest any power from it. This will be the ultimate test of Trump’s beliefs. If he truly has shifted rightward, he will fight back, and “drain the swamp” as he promised during the campaign. If however he allows his past moderate Democrat roots to take over he will back off and do what the Republican leadership has been doing for the past two decades: retreat in the face of the slightest opposition. What makes me most hopeful that Trump will actually “drain the swamp” is that he will enter office with a solid Republican congress, made up of more true conservatives then we have ever seen. This more than anything will help keep him from wavering from his promises. One other thought for the moment: The closeness of this election is still disturbing. Trump was not a great candidate, but Clinton was a truly corrupt one. That so many Americans were willing to look the other way even after almost three decades of documented dishonesty and lying and still give her their votes does not speak well of them. Until that basic fact changes, the American system of government remains very fragile and exposed to destruction from within. No wonder all those mainstream newspapers are endorsing them: When asked if if Gary Johnson was more qualified to be president than Hillary Clinton, the Libertarian Party’s candidate for vice president, Bill Weld, expressed almost unqualified enthusiasm for Clinton. When asked by NBC’s Chuck Todd if Johnson is more qualified for the presidency than Clinton, Weld responded that he is “not sure” if “anybody is more qualified” than Clinton for the position. Weld made the remark after expressing his displeasure with the idea of Donald Trump assuming the office. It increasingly seems to me that Johnson and Weld’s sole purpose is to provide an option for those mainstream Republican RINO’s who hate Trump for irrational reasons and don’t want to vote for Hillary Clinton. The Libertarian candidates appear to give them a moderate choice (emphasis on the word moderate) that is also acceptable to the Washington crowd. I mean, really, how could anyone show up at a cocktail party in Silver Spring, Maryland after supporting Trump? Link here. The analysis is detailed and thoughtful, and gives some perspective about the state of power and control by the present leaders in Russia. Four parties are expected to secure again their representation in the Duma: the ruling United Russia (UR), the Liberal-Democratic Russian party (LDPR), led by Vladimir Zhirinovsky, Just Russia, led by Sergei Mironov, and the Communist Party of the Russian Federation (KPRF), led by Gennadi Zyuganov. In contrast, the democratic opposition has fewer chances of being represented. The opposition Russian Democratic Party (“Yabloko”) and People’s Party of Freedom (RPR-PARNAS), cofounded by murdered opposition politician Boris Nemtsov (October 9, 1959-February 27, 2015), will contest the elections separately – a suicidal tactic that mathematically further reduces their already slim chances to enter the Duma and further reduces the credibility of Russian liberalism. The democratic opposition is represented in the elections by yet another independent nominee -Maria Baronova, running with the support of Open Russia movement, founded by former oil tycoon-turned-activist Mikhail Khodorkovsky, residing out of Russia after his release from long term jail. Bottom line: Putin will remain in power, no matter what happens in today’s elections. Nonetheless, the article is worth reading because it gives some sense of what might happen after Putin. What, me worry? Russian hackers attempted and were partly successful in June in accessing the election databases of Arizona and Illinois. Hackers targeted voter registration systems in Illinois and Arizona, and the FBI alerted Arizona officials in June that Russians were behind the assault on the election system in that state. The bureau described the threat as “credible” and significant, “an eight on a scale of one to 10,” Matt Roberts, a spokesman for Arizona Secretary of State Michele Reagan (R), said Monday. As a result, Reagan shut down the state’s voter registration system for nearly a week. It turned out that the hackers had not compromised the state system or even any county system. They had, however, stolen the username and password of a single election official in Gila County. The article describes in detail the overall bad situation, including a number of additional attacks as well as the poor security surrounding the online voting option that more than 30 states use. Tom Hicks, chairman of the federal Election Assistance Commission, an agency set up by Congress after the 2000 Florida recount to maintain election integrity, said he is confident that states have sufficient safeguards in place to ward off attempts to ma­nipu­la­te data. For example, if a voter’s name were deleted and did not show up on the precinct list, the individual could still cast a provisional ballot, Hicks said. Once the voter’s status was confirmed, the ballot would be counted. Hicks also said the actual systems used to cast votes “are not hooked up to the Internet” and so “there’s not going to be any ma­nipu­la­tion of data.” However, more than 30 states have some provisions for online voting, primarily for voters living overseas or serving in the military. Hicks has made me feel so much better! The November Democratic primary expands! Gary Johnson, the Libertarian Party candidate for president, has now announced his support for a carbon tax, this following earlier positions that rejected religious liberty and endorsed gun control. Read the story at the link. It is very clear that libertarian principles have little to do with Johnson’s campaign. He is running as a moderate liberal, through and through. Adding the Green Party candidate Jill Stein we now have four liberal Democrats running for President, with two (Clinton and Stein) occupying the communist wing of the party and two (Trump and Johnson) occupying the moderate liberal wing of the party . O joy! Today a former Romney official, one of many similar establishment Republicans from the Romney campaign as well as the Bush administration, announced in an op-ed that he is voting for Hillary Clinton in the general election. I haven’t reported on this stream of Clinton endorsements by Republican politicos, as I generally consider most such endorsements to be meaningless. However, I think it important to make one comment. It is perfectly understandable if a conservative decides that he or she cannot support Donald Trump for president. Trump’s past history as a liberal Democrat certainly makes him a poor choice if you happen to be a sincere conservative who believes in the Constitution and small and limited government. At the same time, if you are a sincere conservative you don’t then announce that you are endorsing Hillary Clinton and will vote for her instead. You either don’t vote for anyone for president, or you pick the Libertarian Party candidate Gary Johnson, who has his own problems but at least has a past conservative track record. By throwing their support to Hillary Clinton, these establishment Republicans are finally revealing to the world that they really never had any interest in conservative values and have always been lying when they said so. Instead, they are simply more interested in the power they gain in Washington, and will do whatever it takes to obtain that power, including supporting the most socialist, corrupt, and dishonest Democratic Party candidate presented to us in the past century. Thus, these endorsements are actually very useful information. They finally tell us who the fake conservatives in the Republican Party are and, should Donald Trump win in November, will allow him to finally purge the party of these liars and backstabbers, so that we might be able to finally make real some progress in gaining some control over our presently very oppressive and destructive federal government. This article gives a nice overview of the people who it appears are being considered for positions in a Trump presidency, should he win. 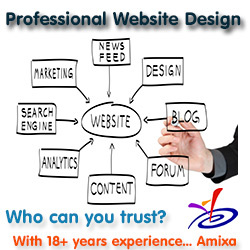 Unfortunately, it does not give a lot of background about the people mentioned. Many, like Chris Christie, Jeff Sessions, Rudy Giuliani, and Newt Gingrich, are well known. Others, like businessman Donald McGahn, are unknown. Some, like Senator Bob Corker, suggested as potential Secretary of State, would be a disaster, based on his past history of getting the Iran deal approved. Some. like Harold Hamm and Steve Mnuchin, have been described here at BtB at the links behind their names, Hamm positively and Mnuchin negatively.. There is more at the link. Read it all. This list is a start. It will require vetting to get a sense of what we can expect from a Trump administration. Note that there is a reason I am so focused on Trump and not Clinton. Trump remains an unknown, who might be worth voting for if it appears his plans as President are reasonable, something that might still be possible, despite all the negative reports I’ve given him. Moreover, there is a chance that Trump can be positively influenced. Learning as much about him as possible increases that possibility. Clinton however is not an unknown. She is corrupt, a liar, and an avowed socialist who believes strongly in increasing the size and power of the federal government, as does the entire political party that supports her. To deny any of this is to live with your head in the sand. She thus needs no vetting. Update on the November Democratic primary: Donald Trump is considering creating two super-pacs expressly focused at destroying the political careers of Ohio Governor John Kasich and Texas Senator Ted Cruz. The source close to Trump’s thinking indicated that Trump would consider forming the super-PAC whether or not he wins the presidential election in November. This sure doesn’t sound like the actions of a Republican and conservative looking for allies within his party. Instead, it sounds like a Democrat who, having gotten the Republican nomination for President, can now stop pretending and begin the process of using his position to destroy the conservative movement in the United States in order to make it easier to impose liberal policies. Trump’s supporters keep screaming that Cruz should have endorsed Trump for party unity. Well, the same applies to Trump — to bring the party together — only more so, since he has the nomination for president and as such is the de facto leader of the party. Moreover, while Cruz’s speech could have been more carefully worded, it nonetheless laid out the arguments for voting against Hillary Clinton and supporting all Republicans nationwide, even Trump (though unstated). Trump however is clearly doing the exact opposite, considering the investment of millions of his own money to actively work to defeat two of the party’s more conservative Republicans. But hey, Trump can win! Who cares what he stands for! Trump Treasury Secretary to be former Clinton donor and Goldman Sachs banker? According to one Trump fund-raiser, should Donald Trump win the presidency he plans to nominate for his Treasury Secretary a former Clinton donor and Goldman Sachs banker. [Steve] Mnuchin, who is a former donor to Hillary Clinton, spent 17 years with Goldman Sachs, where his father also had been a prominent executive. He later worked with investment groups affiliated with George Soros, including as chairman of controversial mortgage lender OneWest Bank Group (which would later be acquired by CIT Group). He also has spent time as both an art dealer and film producer. Heh. I seem to remember how Ted Cruz was attacked because his wife worked for Goldman Sachs. Trump was going to save us from the big bankers! I myself am not really bothered by this man’s connections with Goldman Sachs. What worries me is that Mnuchin previously supported Hillary Clinton and also has ties to the very leftwing money-man George Soros. Thus, this story once again underlines the need for voters to elect as many conservatives to Congress as possible, in order to limit the influence of Trump’s liberal friends. It appears that Donald Trump has chosen Indiana governor Mike Pence as his vice presidential running mate. This article provides a detailed look at Pence’s background, which is decidedly conservative and tightly linked with tea party philosophy. Trump’s choice here is definitely encouraging. It suggests that his claimed conversion to conservative values might actually be sincere (though clearly shallow), because it suggests he is looking for conservatives to help him figure out how to be a conservative. As I’ve said repeatedly, the best way to make sure Trump governs as a constitutional conservative is to surround him with constitutional conservatives. This choice indicates that he is not going to resist that possibility. Let me add that picking Pence could help Trump significantly in garnering support from the status quo Republicans that have been resisting him, since these same people respect Pence highly. Let me also add one cautionary note. I have a memory of Pence at one point waffling on conservative principles for political gain, but I cannot at all remember the context or situation. Thus, it is important to remind ourselves repeatedly that these are all politicians, and that their interest is not necessarily that of the nation’s but of their own self-interest, which means getting elected. At any time they could toss the Constitution in the trash heap if that is what they think will get them votes. UPDATE: This article outlines Pence’s waffling as governor in Indiana, confirming my reservations about him. It is therefore very important to not only surround Trump with conservatives, all politicians must be surrounded by voters who demand they defend our rights and our freedoms, as defined by the Constitution. Only then can we be reasonably assured that those rights will be defended. More news on the upcoming November Democratic primary: A new poll in Utah shows Donald Trump getting only 29% of the vote, with Hillary Clinton getting 26%, and Libertarian Party candidate Gary Johnson getting 16%. The article correctly notes that Utah has been solidly Republican for decades, until now. Bear in mind that Utah is a state that Mitt Romney won 73/25 over Barack Obama in 2012, boosted no doubt in part because of Romney’s Mormon faith. Still, John McCain won Utah in 2008 by a 63/34 margin as well. Utah has not been competitive in decades, with the smallest margin in recent times coming in 1996 — a 21-point win by Bob Dole on his way to a national defeat. When Johnson took the tiller in New Mexico in 1995, the budget stood at $4.397 billion. When he left in 2003, it had grown to $7.721 billion, an increase of 7.29 percent a year. Of the eleven governors who filed to run for president this year (two Democrats, Johnson, and eight Republicans), only one had a worse record on spending growth. In New Mexico, Bill Richardson, Johnson’s Democratic successor, clocked in a little better than he did, but Richardson’s successor, Susana Martinez, has shown what a fiscal conservative looks like: New Mexico currently spends less than it did when she took office. It’s not just at a state level that being more fiscally conservative than Johnson is a bipartisan achievement. Federal spending during the time Johnson was in office grew at an average annual rate of 4.49 percent. Late Clinton and early Bush weren’t as successful in their efforts to fight spending cuts as they might have been, but Johnson makes them look like Coolidge, and federal spending since then has grown at an average annual rate of 4.56 percent. My biases are clear up front: I don’t trust Trump. I don’t trust his promises, because he has shown no willingness to hold to them. I don’t trust his ideology, because he proclaims that his guiding star is his own self-assurance. I trust Trump to be Trump: a man of convenience, a thinker of no great depth, a reactionary with no constitutional understanding and a willingness to maximize executive power. The analysis is fair, however, and notes some smart things Trump might do, based on his past record, as well as the dumb things we can expect from him. I post this not to suggest I prefer Hillary Clinton over Donald Trump. I do not. Clinton is a corrupt, power-hungry leftwing ideologue who will magnify all the bad things Barack Obama has done, supported by a corrupt, power-hungry leftwing Democratic Party that likes everything Barack Obama has done. We need to do everything we can to prevent her election. At the same time, we mustn’t blind ourselves to the problems we will face should Trump win. This article is a warning. Prepare yourself, because things are not going to be much better under a Trump presidency, and the best option for minimizing that damage is to make sure Congress is as conservative as possible. The real Republican election: Though Donald Trump is likely to win the upcoming Washington primary and thus its delegates, at the state’s convention this weekend the party chose a slate of Ted Cruz backers to be those delegates, even if they have to vote for Trump. This is how we change things, regardless of who wins the election in November. Get conservatives into government at the ground level. Have them dominate policy issues. Have them move up the ranks and dominate the state legislatures. Have those winners move up and dominate Congress. We do that, and it won’t matter much who is president, because it will be these legislators who will control the agenda. In a sense, this is why Trump’s liberal tendencies are probably less of a threat than Clinton’s committed socialism. Give them both a conservative Congress and Trump, being more malleable, will bend to its will while Clinton, a hardline leftist, will fight it every step of the way. This is another reason I like Cruz. He understands this, which is why he worked so hard to build a grass-roots foundation for his campaign. He might not be the president, but when the next president starts trying to make policy it will be Cruz’s people who will guide him. It is thus very important that conservatives do not boycott the upcoming elections, even if they choose not to vote for a presidential candidate. It is essential the Congress and the state legislatures remain firmly conservative, and for that to happen conservatives have to vote. Three stories today illustrate forcefully why voters in 2016 chose Donald Trump first as their Republican presidential candidate, with Ted Cruz a very strong second, while rejecting forcefully the establishment standard-bearers such as Jeb Bush, Marco Rubio, and John Kasich. The first story shows video of Hillary Clinton baffled because a businesswoman’s health insurance costs doubled since Obamacare was passed. Watch the video. She can’t even consider the possibility that Obamacare is the cause. She in fact says it is “a big step forward” only to have hostile groans ripple through the audience. Later she bluntly says “”What could have possibly raised your costs $400? That’s what I don’t understand?” and members of the audience once again laugh at this blindness. Everyone knows that Obamacare has been a disaster that is driving costs up. Clinton refuses to recognize that, which is why she is having so much trouble clinching her party’s nomination, and why people dislike her so much. The second story is about an investigation being launched by Senator John Thune (R-South Dakota) and Senate Republicans into the squelching of conservative news stories by Facebook. Rather than figure out how to get some control over the budget, these clowns want to harass a private company. Facebook’s actions might have been politically motivated, dishonest, and aimed at censoring conservative viewpoints, but they were also entirely legal under the first amendment. As noted here, the Senate has no business investigating Facebook. The Republicans calling for this investigation should sit down and shut up. Moreover, by even focusing on this Thune is demonstrating why the Republicans who now run Congress have failed so miserably in garnering voter support. The third story is an example why Cruz, and Trump, were successful and popular with voters In his return to Washington, Ted Cruz didn’t whine about his defeat by Trump, or attack or insult the voters. Instead, he focused in on why Trump and he did well. If the Republicans had for example simply done what Ted Cruz has tried to do in Congress these past few years, get Obamacare defunded, even if it meant closing down the government, they might not now be faced with having Donald Trump as their standard-bearer. By refusing to fight for the things the voters wanted, they disqualified themselves in the voters eyes, which is why they lost.